Remember the upcoming Predaplant and Frightfur VJump subscription promotional cards? Their effects have been revealed! (1) During your Main Phase of the turn this card is activated: You can target 1 face-up card in a Spell & Trap Zone, except this card; destroy that card. (1) During the End Phase of the turn this card is Normal/Special Summoned: You can discard 1 Plant monster; Special Summon 1 Level 4 or lower Plant monster from the Deck. (1) You can Tribute 1 Level 4 or lower “Frightfur”, “Fluffal” or “Edge Imp” monster; Special Summon 1 Fiend-Type monster with the same Level but different card name than that of the Tributed monster. You can only use each Monster Effect of this card’s name once per turn. (1) During your Main Phase: You Can Special Summon 1 Level 4 or lower “Frightfur”, “Fluffal” or “Edge Imp” monster from your Deck. For the rest of this turn, you cannot Special Summon monsters from the Extra Deck, except Fusion Monsters. 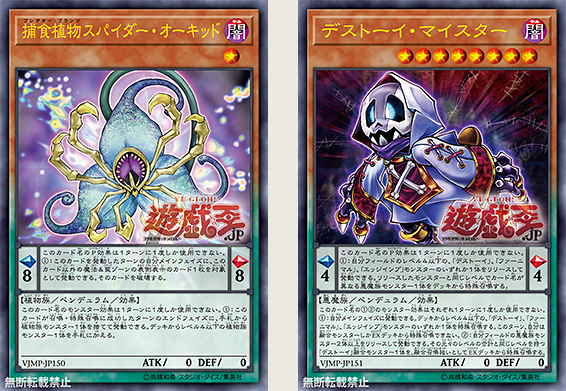 (2) Tribute 2 or more Fiend Monsters on your field; Special Summon 1 “Frightfur” Fusion Monster from your Extra Deck whose Level is equal to the total original Levels of the Tributed monsters, ignoring the Summoning conditions.